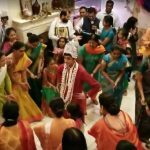 Categories: Bhakti, Divine Names, Guru, Mahans, Sri Swamiji's Kirtans. 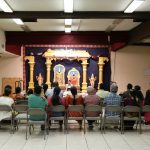 On Saturday, Apr 21, Sri Poornimaji conducted a satsang at Sri Venkateshwara Temple of Corpus Christi, TX. Corpus Christi is another city in Texas, located about 220 miles south-east of Houston along the Texas coast. 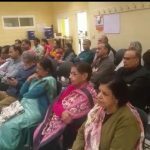 Members of Houston GOD satsang had performed Nama sankirtan and Bhajans at the Corpus Christi temple about seven months ago, and the temple had graciously once again invited the Houston satsang members along with Sri Poornimaji to once again conduct a satsang there. 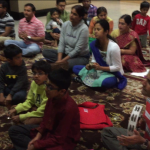 The satsang began at 5:30 pm with 30 minutes of Nama sankirtan and Kirtans of Sri Swamiji. Following this Sri Poornimaji spoke about the Greatness of the Divine Name. Interspersing her talk with beautiful kirtans, she spoke about the power of the Divine Name. 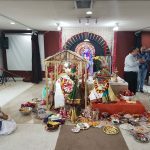 She wonderfully illustrated what the Divine Name can do even when chanted unknowingly, with the charitra of Sant Soordas, who was originally a blind beggar boy who used to say the “Sri Krishna Govinda..” without even knowing that they were the Lord’s Names. Simply chanting those Names took him to his Guru, Sri Vallabhacharya, and bestowed him with Divya Drishti of the Lord! 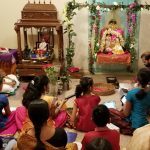 About 50 people listened spellbound to Sri Poornimaji’s discourse that lasted well over an hour and a half, and were completely moved by it.